The P4 Fastel stand alone self-testing system is the simplest format and is ideal for existing premises requiring upgrades, new premises with less than 50 emergency lights, premises where there is nobody to regularly carry out testing and premises which are routinely unmanned. Emergency lights, conversions and signs are equipped with Fastel self-test inverters or drivers. In addition to operating the product into which they are fitted in case of genuine mains failure, the Fastel control modules automatically perform a fully automatic self-testing routine which exceeds the minimum test requirements demanded by BS 5266, without manual intervention.In the event of a failure of the emergency lighting unit to perform to specification, clear visual and audible signals are generated on fittings as shown in the table below. This clearly indicates the nature of the failure to untrained staff so that they can contact maintenance staff to promptly rectify the indicated fault. Standalone fully automatic self-testing emergency lighting in accordance with ATS type PERC classification, as classified by BS EN 62034. Luminaires and signs incorporate self-contained emergency lighting operation with built-in standalone self-testing in accordance with ATS type S, as classified by BS EN 62034. Luminaires and signs automatically carry out testing in excess of the requirements of BS EN 1838 / BS 5266 Part 7. A self-testing programme embedded in the microprocessor built into the inverter / driver modules automatically initiates and controls tests of the emergency lighting unit and provides status indication through a single multi function bi-colour LED indicator. A sounder in control modules operates for 10 seconds every hour until the fault is rectified reinforces fault indication . The sounder may be deleted as an order option. Nominal Test Cycle – To ensure that adjacent units do not test simultaneously, all test sequences programmed into the integral microprocessor controllers are randomly set during production to test up to +12 hours from a nominal eight day cycle. Eight days after an uninterrupted mains supply is connected to control modules, a fully rated duration commissioning test is automatically carried out, checking both lamp and battery capacity, followed by continued discharge of the connected battery to a preset deep discharge protection point, after which it is automatically recharged. from the connected battery. 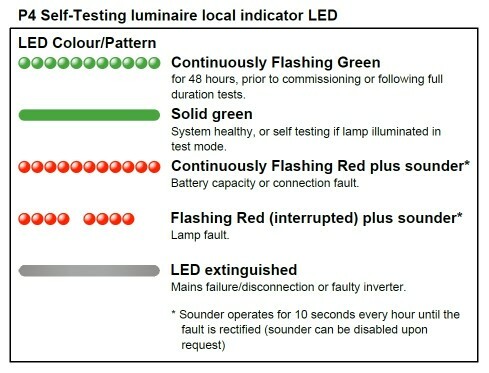 Every subsequent nominal eight-day period, a further brief functional test is automatically carried out to check that the emergency lamp operates from the connected battery. After completing 10 consecutive functional test cycles, units automatically carry out a rated duration test to check both lamp operation and battery capacity. The connected battery is then automatically fully recharged. This cycle is repeated until the 44th test when a full duration test with additional battery training is carried out. Once the mains supply is reconnected after an interruption of greater than 5 minutes, the connected battery will be fully recharged for 48 hours and test cycle will resume. A test cannot be carried out within 24 hours of the previous test or a mains failure exceeding 5 minutes. To comply with the requirements of BS 5266 the indicator LED status shall be manually recorded at least monthly. As Fastel Standalone – fully automatic self-testing emergency lighting technology. This LED Pattern applies to Fastel Standalone, Fastel Link and Fastel SRM. Eight days after an uninterrupted mains supply is connected, the unit undertakes fully rated duration commissioning test, checking both lamp and battery capacity, followed by continued discharge to a preset deep discharge protection point. Eight days after the commissioning test the two minute functional test checks that the emergency lamp operates from the battery. Every eight days a further two minute functional test again checks that the emergency lamp operates from the battery. After performing 10 consecutive functional test cycles, the unit will carry out a duration test to check both lamp operation and battery capacity. The battery is then fully recharged. This cycle is repeated until the 44th test when a full rated duration test is carried out. Once the mains supply is reconnected after an interruption of greater than 5 minutes, the battery will be fully recharged for 48 hours and test cycle will resume. A test cannot be carried out within 24 hours of the previous test or a mains failure exceeding 5 minutes. To ensure that adjacent units do not test simultaneously, all test sequences programmed into the integral microprocessor controllers are randomly set during production to test up to +12 hours from the nominal cycle. Fastel self-testing emergency lighting systems all comply with BSEN 62034, Automatic test systems for battery powered emergency escape lighting, which provides assurance to the user that the systems will comply with the legislative requirements to carry out testing of the emergency lighting as specified and avoid any risk of prosecution for not doing so. In order to comply with the requirements of BS 5266 to record the results of testing of the emergency lighting, it is necessary for somebody to record the indicator status of all indicator LEDs on the installed emergency lights at least monthly.